"I'm trash!/Dead last!/I'm trash!/Fading fast!" This shouted verse from "I'm Trash," first track from Ain't No Blood in Lies, the newest album from reformed 90s pigfuckers The Chrome Cranks, was enough to warm my heart, inspire a smile to crease my cheeks and warrant a full listen. 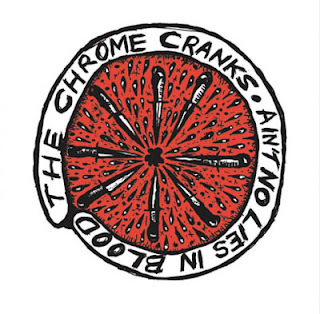 The gritty un-oiled engine of guitar chords that motor along keep the entirety of Ain't No Blood in Lies in a lovely state of disrepair, the band's commanding assemblage of Cramps' style punkabilly (especially with "Let It Ring") and Jesus Lizard atonality a heavenly mixture for anyone whose ears respond happily to discord. "Rubber Rat," with its bass throb and chunky guitar tone, takes advantage of distortion to produce a great payoff and the following "Living/Dead" is just a heavy and straight-up acidic. "Star To Star" has a guitar solo that sounds like it was played with rusty bedsprings. "Broken-Hearted King" is all wind-up and grind down, a perfect little punk blues track with a bouncing tempo. 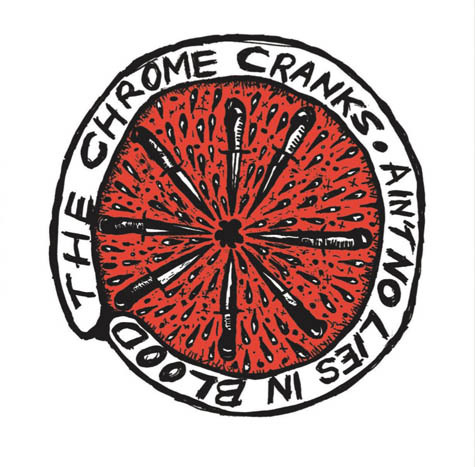 The album ends with its own little "Sister Ray," the 10+ minutes of "Lover of the Bayou" which finds The Chrome Cranks seeing how far they can take a caustic rut.